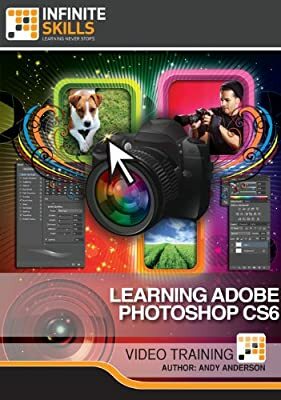 In this Adobe Photoshop CS6 video training course expert author and trainer Andy Anderson introduces you to the basics of this graphics software from Adobe. Photoshop is a huge and complex program, but Andy breaks it down into bite sized pieces that anyone, from beginner to more experienced users can understand. This course is designed for a beginner, and no prior knowledge of Photoshop is assumed. This tutorial covers the essential features of Photoshop that everyone should be familiar with. Andy starts by taking you through the interface, including the preference setup. Once you are familiar with navigating and finding tools, you cover topics such as Adobe Bridge, Camera Raw, adjusting color, layers, blending, adjustments, the pen tool and paths, as well as dodging and burning. With over 13 hours in this software training video, you also go into detail with filters, manipulating images, selections, levels and curves, and so much more. By the conclusion of this video tutorial for Adobe Photoshop CS6, you will have a clear understanding of what Photoshop has to offer, and how you can use the available tools, and apply the demonstrated techniques to enhance your own images. Working files are included to allow you to practice alongside the author as he teaches you during this course.